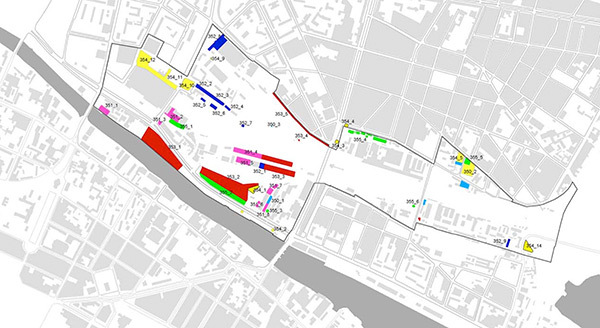 Mapping of temporary uses located at disused former railway land near Berlin’s Ostbahnhof. Source: Studio Urban Catalyst, 2001. In many cities, urban wastelands and vacant structures suddenly metamorphose into exuberant places. After city planners and the real estate market have failed in their initial attempts to develop them, these sites become the setting for clubs and bars, start-up firms and art galleries, migrant economies and informal markets, recreational activities and nightlife. Indeed, it is often precisely here that innovative cultural production and a vibrant public sphere are to be found. The Urban Catalyst project investigated the various unplanned and informal uses of these spaces, which fall outside the remit of traditional urban planning. Together with 11 research partners from the case study cities of Berlin, Vienna, Amsterdam, Helsinki and Naples Urban Catalyst organised a series of events, exhibitions, publications and workshops, in order to develop strategies for addressing the link between unplanned and informal processes and the formal urban design of contemporary cities. The research explored the agency of citizens as initiators of urban development processes. Urban Catalyst revealed various ways in which city planning can incorporate informal processes and draws lessons that could inform alternative practices of architects and city planners. Amongst the most prominent projects initiated by Urban Catalyst was the co-initiation and coordination of ZwischenPalastNutzung in 2004 and 2005: The temporary cultural use of the former Palace of the Republic in central Berlin triggered international attention and an intense debate questioning the reconstruction of the historic Berlin castle. The results of the research project were published in the book “Urban Catalyst – The Power of Temporary Use” (DOM Publishers, 2013).